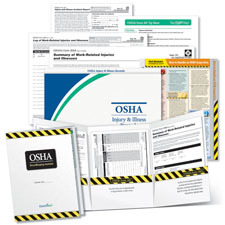 Every year between February 1 and April 30, the Occupational Safety and Health Administration (OSHA) rules require covered businesses* to review the prior year's OSHA safety forms and post a summary of injury and illness information. The ComplyRight™ OSHA Recordkeeping System takes the guesswork out of the regulations and makes it easy to complete your OSHA safety forms and post the right OSHA safety information, in full compliance with the law. *All employers with 11 or more employees are required to post OSHA Form 300A between February 1 and April 30, with the exception of partially exempt industries. These industries are exempt from recordkeeping requirements unless specifically required to do so by OSHA.